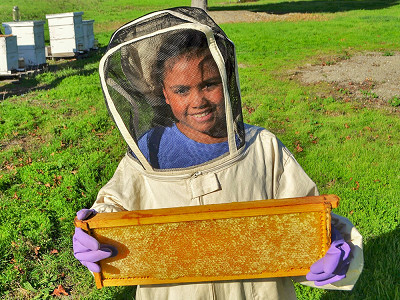 Planet Bee Foundation builds hands-on educational programs aimed at long-lasting care for one of the most important global economic players—the honey bee. Bees are vital to the sustainability of agricultural production, but the increased use of insecticides, the effects of climate change, and other factors threaten their population worldwide. Planet Bee primarily focuses on exposing kids to these issues and empowering them to act. Their activities take place outside, away from a screen, and encourage curiosity and a connection with nature. The hope is kids will be inspired to be environmental stewards at a time when they are shaping their own set of values. Bill and Debra Tomaszewski were struck by the reports of Colony Collapse Disorder, a phenomenon that dismantles bee populations. They wanted to galvanize a green-minded generation through interactive workshops. 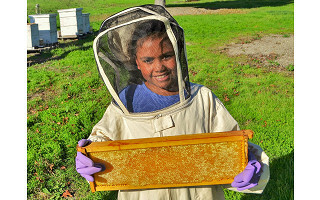 They now bring their programs like The Humble Honey Bee and Zombee Watch Projects to schools, nonprofits, and businesses. By providing kids and adults alike with the tools to combat environmental issues in their own community, they’re teaching them the power of individual action and its global impact. Planet Bee primarily focuses on exposing kids to these issues and empowering them to act. Their activities take place outside, away from a screen, and encourage curiosity and a connection with nature. The hope is kids will be inspired to be environmental stewards at a time when they are shaping their own set of values. 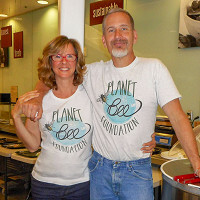 Bill and Debra Tomaszewski were struck by the reports of Colony Collapse Disorder, a phenomenon that dismantles bee populations. They wanted to galvanize a green-minded generation through interactive workshops. They now bring their programs like The Humble Honey Bee and Zombee Watch Projects to schools, nonprofits, and businesses.